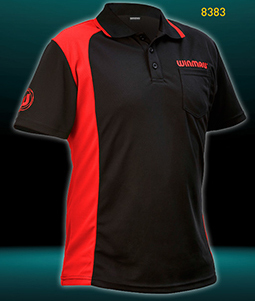 Winmau's stylish WinCool 2 dart shirt with integrated pocket is designed to keep you cool and comfortable and allows your throwing arm to move without restrictions. Engineered with unique WinCool 2 material, this extreme technology is designed to wick moisture and dry fast - even in the hottest conditions. Mesh ventilation and antimicrobial technology is strategically positioned in critical heat zones and employed throughout the entire shirt for maximum breath-ability leaving you cool, dry and odorless to play your best darts. *NOTE: Many customer purchase 1 size up. So, if you wear a XL; you might want to consider a XXL for comfort.